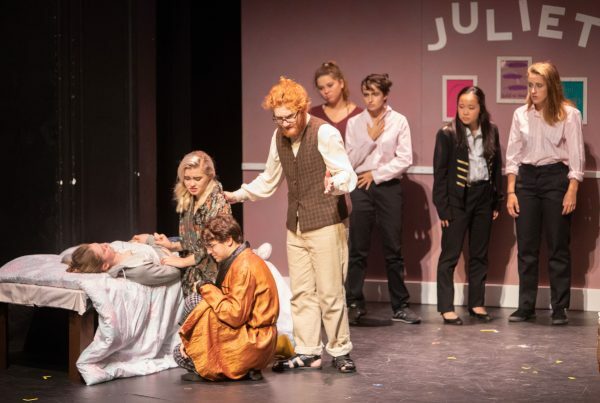 It�s hard to imagine that even the Bard himself would not be in awe of Laguna Beach High School Drama & Park Avenue Players� current offering, �Romeo & Juliet,� now playing at the LBHS Theatre through November 11th. Produced by Alexis Karol, the theatre�s refreshingly genuine take on Shakespeare�s most famous and enduring love story, coupled with impeccable production talent, meets and exceeds the lofty expectations from audiences from this award-winning high school. Underscored by ingenious wit and engaging dialogue, the play pits the bitterness of resentment against the intensity of romance in a tale so well-known it scarcely needs an introduction. Sprinkled with a generous helping of boy meets girl, the show never fails to amaze and surprise. And here is no exception. �Romeo & Juliet� is a tragedy written by William Shakespeare early in his career about two young star-crossed lovers whose deaths ultimately reconcile their feuding families. It was among his most popular plays during his lifetime and is one of his most frequently performed plays even today. Transposed to a fictional California town called Verona (a real city in northern Italy), where Montague outcasts fight against a ruling elite who have commodified the Capulet women, we find the two young lovers Romeo and Juliet in a mad, adrenaline-driven headlong rush toward doom. It is filled with the passion of young love, violence and prejudice in an incredibly powerful show delivered by a hard-working cast of 26 young thespians, who, despite a minimal amount of previous exposure to Shakespeare for the most part, demonstrates an authentic comprehension of the material and appear totally immersed in the play. Helming this new, modernized Shakespearean production, Director Michael Irish brings an exhilarating sensibility to this timeless classic about the intensity and joy of first love and attraction amid a dangerously divided community. Adapted numerous times for the stage, the play was revived during the English Restoration, removing material then considered indecent. Georg Benda's "Romeo und Julie" omitted much of the action and added a happy ending. John Gielgud's 1935 stage version kept very close to Shakespeare's text and used Elizabethan costumes to enhance the drama. More currently, the play has been adapted in versions as diverse as George Cukor's 1936 film "Romeo and Juliet," Franco Zeffirelli's 1968 version "Romeo and Juliet," and Baz Luhrmann's 1996 MTV-inspired "Romeo + Juliet." It�s interesting that some of the most performed plays in the English language are more than 400 years old, with Shakespeare still reigning number one. The titles alone are household names. It is virtually impossible not to acknowledge the influence of Shakespeare on audiences, but it simply helps prove the case that Shakespeare's themes and stories have a timeless quality -- especially when the language is not updated. It�s a testament to the playwright and the director when you can take the underlying story in the play and modernize it, but still retain the beauty of the language with an authentic, comprehensible performance. Charlie Besso and Zoe Waters portray the title roles with a recognizably youthful exuberance. Shakespeare tells us that Juliet is �not yet fourteen.� With her long blond hair and sweet face, Ms. Waters embodies the traditional Juliet, flirting with Romeo and teasing him with metaphors and sparkling eyes. She defies her parents reluctantly, but without wavering. Later, she finds the wherewithal to execute a daring plan that she hopes will enable her to not only be true to Romeo, but also avoid unwanted marriage to the man of her father�s choice, the wealthy aristocrat, Paris (Joseph Hovanesian, who has great stage presence). Juliet, wiser than her years, is plausible as a teenage girl, but soon reveals herself to be the strong woman she won�t have a chance to become. We are not given Romeo�s age, although he might perhaps be as old as sixteen. Nevertheless, Romeo was just breaking out of adolescence at the time. From his first appearance on the stage, he comes across as a teenager trying to make sense of himself, his body, his feelings and the boundless energy that consumes him to no purpose. Before Romeo meets Juliet, he loves Rosaline, Juliet's cousin. He describes her as wonderfully beautiful: "The all-seeing sun�ne'er saw her match since first the world begun." According to Romeo, Rosaline has sworn off boys by taking a vow of chastity, and never gives Romeo the time of day. But the real story of the play begins when he sets eyes on Juliet, at which point Rosaline vanishes from his consciousness without a moment�s afterthought. Juliet, when she appears is equally feverish. She is stricken with true love on first sight of Romeo when he crashes her father�s party but all modesty and reticence is entirely absent. She, like Romeo, seems rather to be trying to come to terms with emotions she cannot understand and energy she cannot control - all of which is triggered by the sight of Romeo in ways she cannot fathom. It�s easy to see why someone like Juliet feels drawn to Romeo. With tassled hair, wearing suspenders over an oversized white shirt with those slimmer fitted trousers, Mr. Besso is the ultimate in cool. His gait is easy; he dominates his friends. But most of all, Mr. Besso�s style of speech, which emphasizes the poetic rhythm that Shakespeare built into the dialogue, is cadenced and forcefully seductive. The moment he sees Juliet, at the party, he falls for her hard. She cannot possibly resist all of that, nor does she want to. The famous balcony scene is the play�s last happy moment, and Mr. Besso and Ms. Waters make it blossom with the glory of amazingly articulate young love, played with just the right nervous energy and in the way that teenagers in the throes of passion would normally relate to each other, in that day or this. Shakespeare evidently understood young love very well. The changing of genders allowed for some novel representations of well-known characters. Tybalt was impressively played by Malin Glade, Chloe Bryan was fascinating as Juliet�s fussy Nurse and Claire Tigner embodied Balthasar, a servant to Romeo. George Longoria and Rylee Bullington looked regal as the Montagues, and their servant, Abraham, was played by Diego Lapayese-Calderon. A second Capulet was performed by Goose Van Lingen, and a second servant was Eliana Arthur. The clever Mercutio (Giovanna Cecutti) and considerate cousin Benvolio (Luke Salib) were both acted splendidly. Mr. Cecutti exuded charm, brilliantly capturing the erratic nature of one of Shakespeare�s most difficult characters, and Mr. Salib gives the character of Benvolio a multidimensional personality. Alexandra Keyser played Petra and Samson and Gregory are characterized by Yuika Yoshida and Matysse Sybirski. Kelsey Bailey, Sophia Seidensticker and Angelica Jorio handled various roles comprising members of the City Nightwatch in Verona. The Princess of Verona was majestically played by Shelby Thomas. Andrea Galena-Segui is the Apothecary, Harley Firouz is Sister Joan and Paris� page is represented by Elena Sewell. Will Purdy and Ella Bohorquez exemplifies Capulet and Lady Capulet, who had one memorably fretful scene when they decided to disown Juliet, to the point of almost striking her. Rounding out the cast includes Nick Reardon as a loyal and empathetic Friar Lawrence. In Act 2, Juliet seeks counsel from the Friar, who tells her to pretend to accept her father�s decision on her upcoming marriage. He also entrusts her with a vial of a potion to make her seem dead. I�m sure Friar Lawrence meant well, but who gives something like that to a girl not yet 14? Sets are from Legacy Theatrical and Chris Caputo, Sound Design is by Michael Irish and Celena DelPizzo-Howell (who is Assistant Director and also handles Hair & Makeup). The costumes and clothing, designed by Angela Irish and Julie Stevens, range from Napoleonic vests to the latest trends. Choreography is managed by Estee Fratzke, along with Fight Choreography by Michael Irish. The unseen six-piece jazz band was directed by Steve Wade, and Lighting and Tech is by Peter Roche. This show is Highly Recommended! Performances remaining are November 9th and 10th at 7pm and November 11th at 2:30pm. Tickets are now on sale at lbhs.booktix.com (Students $12/Adults $17/Premium $22). In summary, Laguna Beach High School transcends once again. Any lover of the arts is urged not to overlook this enthralling production. In one fascinating choice, Director Irish has virtually eliminated time from this �Romeo & Juliet.� We�re in a space where the calendar hardly matters. Maybe that�s what�s meant by a timeless story.